Constant flow streams from "lost motion" pumps. 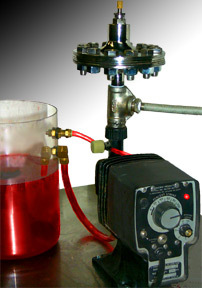 Low Pressure Dosing pressure fluctuation from flow reversal in a single connection damper leave pulsation in your system. Use FLO-THRU dampers. (3) PIPEGUARD PLASTIC Ferric chloride, Na.Hyp.Cl. (4) PIPEHUGGER LP LINED for Bronics, Nitrics, etc. After seeing LPDOS-cost please go to the FLEXORBER SS/LP range price list of off the shelf inventory items, dims., weights and drawing. In place flushable flow through dampers are off shelf, lowest cost standard inventory. (2) Stainless + Elastomer gas bag. After seeing LPDOS-Costs please go to the PIPEGUARD SS/LP range price list of off the shelf inventory items, dimes., Weights and drawing. safer & less expensive than plastic. After seeing LPDOS-costs please go to the PIPEGUARD PLAS. range price list of off the shelf inventory items, dims. Weights and drawing. DON'T FORGET! This takes you straight back to the beginning -- don't use back, back, back Explorer button.